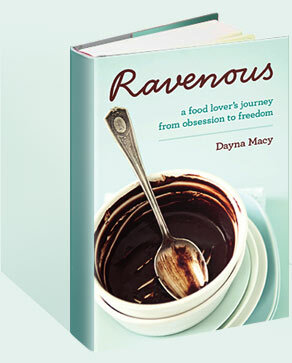 2010 July — Dayna Macy, author of "Ravenous"
Shiratke noodle are suddenly everywhere. First I read about them in a NY Times piece on Lisa Lillien, aka Hungry Girl. Then, someone at work mentioned them. Then a friend told me about them. So I bought some. After rinsing them to get rid of the fishy smell, then frying them in a bit of olive oil, and topping with some homemade pesto, I can honestly say they’re merely edible. A vehicle for a sauce maybe, an interesting enough texture, but my taste buds would never confuse it with real pasta. I’ll just stick to the real thing. I’d rather eat less, and enjoy more. They have nothing to do with each other, except I saw both on Sunday. I went to a Boxer fundraiser because she’s in a tight race against Carly Fiorina (she of the famed “Demon Sheep Ad” against Tom Campbell), who I think is truly awful. I was impressed with Boxer, and she seemed to enjoy herself. Of course, this was in the Berkeley Hills and she was speaking to her peeps. And I loved that she had to dash because she was going to another fundraiser in Marin where Phil Lesh was performing. That night, Scott and I went to see the New Pornographers at the Fox Theater in Oakland. They opened with “Sing Me Spanish Techo” and were completely tight and great from there. And, I got to see A.C. Newman and Neko Case in the flesh. I love this band, which is the only reason this middle-aged girl was still singing and swaying close to midnight. Went to Connecticut to my sister’s wedding. This time, I think she got it right. I watched as she kicked her stilettos off under the chuppah, leaned her head on to her almost husband’s shoulder, and snuggled in. I could feel their happiness and I am very happy for them. Then, off to Florence with Scott, the boys, and his parents. I loved every moment. Scott was a remarkable guide through the Uffizi, making Renaissance art more understandable and alive. I was stunned by Boticelli’s Venus and her remarkable beauty. We visited the Stibbert Museum, where we were all enthralled by the largest private collection of medieval armor. The boys knew all about halbards, chainmail and swords. Our guide, Paola, was enchanted by our knowledgeable American boys. We went to the Academie, where I fell in love with Michelangelo’s David. You can’t believe he made this living, breathing statue out of marble. David, so intelligent, so beautiful, caught in the pause just before he makes his move to slay Goliath. We ate incredible pasta, pizza, octopus and langoustine, and drank espresso at night. We walked hours every day, over the Arno, over the Ponte Vecchio, and through narrow streets. I loved the oldness of the city, its history, but not the taxi rides. Almost got clipped several times. It’s been 15 years since I’ve been to Europe and I will be back soon. Maybe when Ravenous comes out in Italian? Speaking of Ravenous, I’m working on the subtitle. Right now, it’s “A Food Lover’s Search for Balance” — which my editor thinks is blah. So I’m brainstorming ideas, and struggling. A good subtitle is crucial — and it frames the “soundbite” for the book, which I still don’t have. Which is remarkable since in all my PR jobs, I’ve counseled authors to have that sound bite down cold, or else, how can you pitch your book in this sound bite culture of ours. I’ve written my book and still don’t have my elevator pitch. Trouble is, my book is complicated — spanning organics, sustainable agriculture, memoir, eating, overeating, yoga, losing weight – – so this is my July project, my subtitle, my soundbite, and also, beginning the redesign of my website.